New University of Toronto research shows that adoption of self-driving cars – also known as autonomous vehicles (AVs) – could significantly reduce the amount of valuable urban space dedicated to parking. 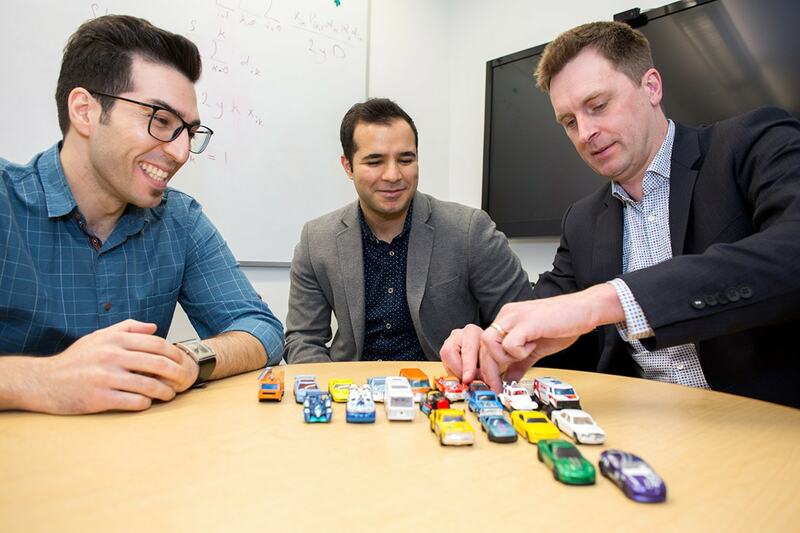 “In a parking lot full of AVs, you don’t need to open the doors, so they can park with very little space in between,” says Matthew Roorda, a professor in the Faculty of Applied Science & Engineering and senior author of a new study in Transportation Research Part B.
Nourinejad, Roorda and their co-author Sina Bahrami, a PhD candidate in the department of civil engineering, created a computer model in which they could simulate the effects of various layouts for AV parking lots. They then used an algorithm to optimize the design for various factors, including minimizing the number of relocations and maximizing the proportion of the lot that was used for parking versus lanes for relocation, entering or exiting. Their analysis showed that, for a given number of cars, a well-designed AV parking lot could accommodate 62 per cent more cars than a conventional one. Depending on parking lot dimensions, in some cases they were able to increase the capacity even further – square-shaped AV parking lots could accommodate up to 87 per cent more cars. This improved use of space could translate into much smaller parking lot footprints, provided the total number of cars that need to park in them remains constant. The research is part of the iCity: Urban Informatics for Sustainable Metropolitan Growth project, an initiative of the University of Toronto Transportation Research Institute. It is funded by the Ontario Research Fund – Research Excellence, as well as a consortium of industrial partners.